Today is Patch Tuesday and Microsoft has just rolled out Windows 10 KB4343909. 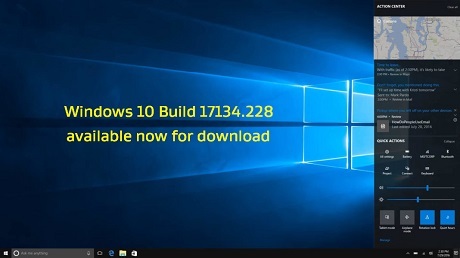 In case you’re planning to upgrade the PC manually, the direct download links for Windows 10 KB4343909 are also available. KB4343909 is available for devices running Windows 10 version 1803 and it advances the system to Build 17134.228. The latest patch for Windows 10 April 2018 Update comes with its own pack of improvements. First and foremost, to check if you’re already running the latest build, press Win key + R and then winver. If it shows Windows 10 Build 17134.228, the cumulative update has installed successfully. If the build number is something else, you would need to Open Settings and navigate to Update & Security -> Windows Update -> Check for updates. The latest patch for Windows 10 April 2018 Update addresses both security and non-security bugs. The update has fixed issues with Internet Explorer and Microsoft Edge. Windows 10 KB4343909 Direct Download Links: 32-bit (x86) and 64-bit. In the changelog, Microsoft explains that the new protections against a speculative execution side-channel vulnerability known as L1 Terminal Fault (L1TF) have been applied. The company says that the vulnerability affects the Intel Core processors and Intel Xeon processors. Microsoft has also addressed an issue that causes high CPU usage and it could result in performance degradation on some system. The systems with Family 15h and 16h AMD processors were experiencing slightly degraded performance. The company is also fixing an issue that prevented apps from receiving mesh updates after resuming. As noted above, the update also includes changes for Internet Explorer and Microsoft Edge. For example, Internet Explorer and Microsoft Edge now support the preload=”none” tag. This patch has also addressed the significantly reduced battery life issue after upgrading to Windows 10 April 2018 Update (version 1803). The patch also addresses an issue that prevents some apps from running on HoloLens. Last but not the least, the update has also addressed an issue that causes Device Guard to block some ieframe.dll class IDs. As you can see, the changelog isn’t really interesting and most of the fixes are aimed at enterprises and businesses. It’s worth noting that Microsoft is aware of one known issues but it has nothing to do with the overall of performance. This means that the company expects it to install correctly on all systems. We’re not aware of any failed installs but we’ll update the article if and when any additional details are available.